If you do not own an impact driver you are missing out on one of the best inventions to become mainstream over the last decade. They are a God send to anyone who drives screws, and many who use an impact driver find it impossible to revert back to driving screws with a traditional powered drill/driver. To learn more, check out: What's the difference between a hammer drill and an impact driver? 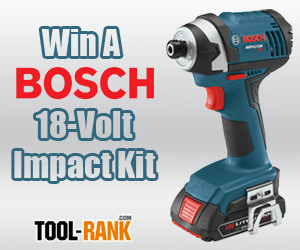 Bosch Tools was awesome enough to sponsor this month's giveaway and provide one of their NEW model IDS181-02 18-volt Impact Driver Kits, so that one more person can experience the pleasure of using their fine impact drivers. The IDS181 is one of their latest impact models and it packs in a ton of features while still keeping size and weight in mind. Delivering 1,150 lbs. of torque, the IDS181 has more power than you will need for most driving tasks, and it more than meets my requirements as a finish carpenter. Other features include a 3-LED light ring, electric cell protection, metal gearbox and more. Visit Bosch to see all the IDS181 has to offer. The giveaway is for the IDS181-02 Impact Driver Kit which includes the Impact Driver, two SlimPack 18-volt batteries, a charger, a canvas carrying case, and a belt clip.